How do we recognize a sick infant or child and know that they need to be treated promptly? 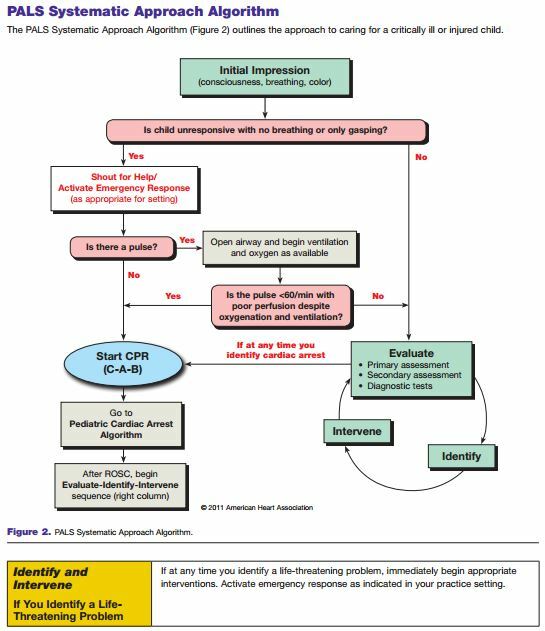 The key is to use the PALS Systematic Approach Algorithm of the 2010 edition Pediatric Advanced Life Support Provider Manual (a modification of the Pediatric Assessment Triangle in the 2006 edition of the PALS textbook). You look at the enter child as you enter the room and you note his or her consciousness, breathing, and color. Consciousness in the newborn and infant can be assessed using the TICLS mneumonic. T stands for tone. And the tone can be from vigorous to limp. Every child including newborns should have good muscle tone, that is, they should not be floppy. I stands for interactive. The infant normally should be interested in his or her surroundings. C stands for consolability. The normal infant should be able to be consoled. L stands for look meaning gaze. The normal infant should follow with his or her eyes interesting objects. A glassy eyed stare is abnormal. S stands for speech or cry. The normal infant should have a normal cry. If the initial impression does not call for immediate action, then the next step is the Primary Assessment (next post). What follows are two outstanding resources. The first is a summary of a part of a lecture which is available from Audio Digest. The lecture itself covers much more than just the Pediatric Assessment Triangle. It is worth getting and listening to. The second resource gives a quick review of the Pediatric Assessment Triangle and more details on the TICLS mneumonic. An outstanding one page quick review of the Pediatric Assessment Triangle (accessed 6-14-2014) is from the Family Practice Notebook. It reads as fast as the above paragraph and has additional useful details about TICLS evaluation as well as other reminders on assessment. This entry was posted in Emergency Medicine, Pediatric Advanced Life Support. Bookmark the permalink.